Motherboard - ATX Socket AM3+ ,DDR3-2000, USB3.0, SATA3, 4xDDR3 DIMM, 1xPCI-E, 2xUSB3, LAN, solid state capacitors, supports RAID 0, 1, 5 & 10. 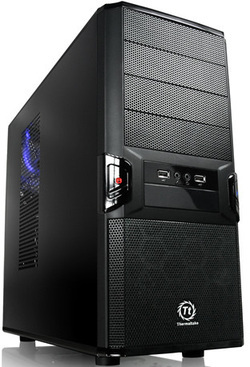 Case - Thermaltake v3 case with see through side cover & 2 blue LED fans. Software installed - WIN7 & office 2010 trial with all updates, AVG anti virus, NERO burning software, latest drivers, updated flash. You will not be disappointed, this PC is amazing, absolute blistering speed, my son recommends playing Battlefield 3 with this PC with everything maxed to unlock the true potential of the game. The graphics card is from Radeon's latest 7000 series (2013), an amazing card for any serious gamer. With the latest wireless network card you now have the option to place this PC in any room. The hard drive and motherboard use the latest and fastest SATA3 technology so you can access a massive 1 TB of data faster than ever before. Plus the motherboard uses solid state capacitors which overcomes the main cause of motherboard failure. The case comes with a side and front fan to keep the contents cool with plenty of room left to add more extras such as HDDs etc. Plus it features the blue LEDs and the see through side cover that is shown in the above picture & we also add another blue LED fan at the front to make it look even better. It not only keeps everything cool but looks cool doing it. This price is for the PC only, no screen, keyboard or mouse. We make these PCs ourselves and we enjoy making them which is why we can offer them at these low prices which are far lower than anything you will find online or on TradeMe, if you would like a different specification then please email us and we will do our best to help. All components are top quality and come with a 1 year return to base warranty for piece of mind. To offer this warranty we have to make the PCs to order, that way we can always sell the latest technology at the best price without having outdated stock sat on our shelves.